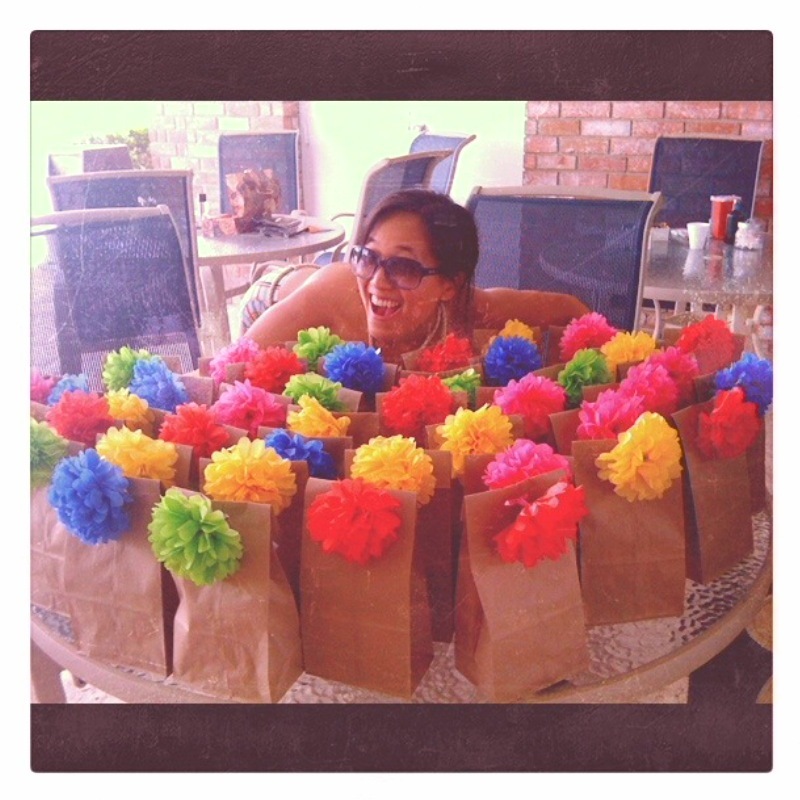 Our Girl Power Pool Party went splendidly! We raised about $100 for SafePlace and everybody enjoyed the henna, PK Acupuncture, Mary Kay makeup samples, pool, food, jello shots, and goody bags. 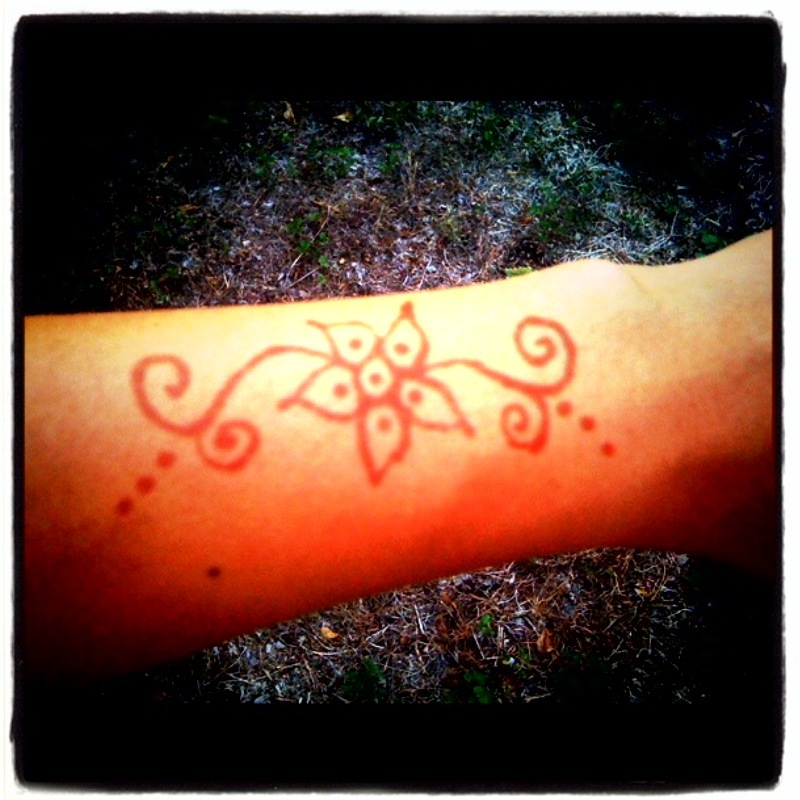 My henna is nice and brown after two days, thanks to La Pham Nikita. For my food contribution, I again went with make half/buy half. It was particularly challenging to choose food for 100°F weather. 1. Shrimp firecrackers – I followed a recipe provided by my friend, Kim of The Ravenous Couple. Make three small cuts on the inside curve of the shrimp so that they don’t curl once fried. Marinate the shrimp in pepper, garlic salt, sugar, and oil in the refrigerator for 45-60 min while the eggroll wrappers defrost on the counter. Using the eggroll wrapper, roll one shrimp with the tail sticking out and a slice of green onion. Seal the end with beaten egg. Place a moist towel over the eggroll wrappers and uncooked shrimp firecrackers to keep them from drying out. Steamy Kitchen provides some helpful rolling photos. Her photos use triangle wrappers, but I used squares and they turned out fine as well. In a deep pan, heat 1 inch of canola oil to 375°F. Fry the shrimp firecrackers in batches until they brown, about 2-4 minutes. Dry on paper towels. Serve warm. This is easy to make but may be time-intensive (about 1 minute to roll 1-2 shrimp firecrackers, 80 shrimp=80 minutes ). But it did seem to be the favorite dish at the party and kept well in the Texas heat. 2. Roasted brussel sprouts – I love the smoky, salty taste of roasted brussel sprouts from The Barefoot Contessa. A nice alternative to fries. 3. Watermelon salad – Another tried and true recipe from The Ravenous Couple minus the candied kumquats. I cubed one seedless watermelon the night beforehand to chill the salad. Right before the party, I added the remaining ingredients—eyeballing what would look pretty. I kept a small ziplock bag of ice under the bowl to keep the salad cool. 4. Baguette House Vietnamese sandwiches that Niki bought. For refreshments, Phyllis made yummy/well-balanced jello shots and set up a mimosa bar while Niki provided some boxed white wine. 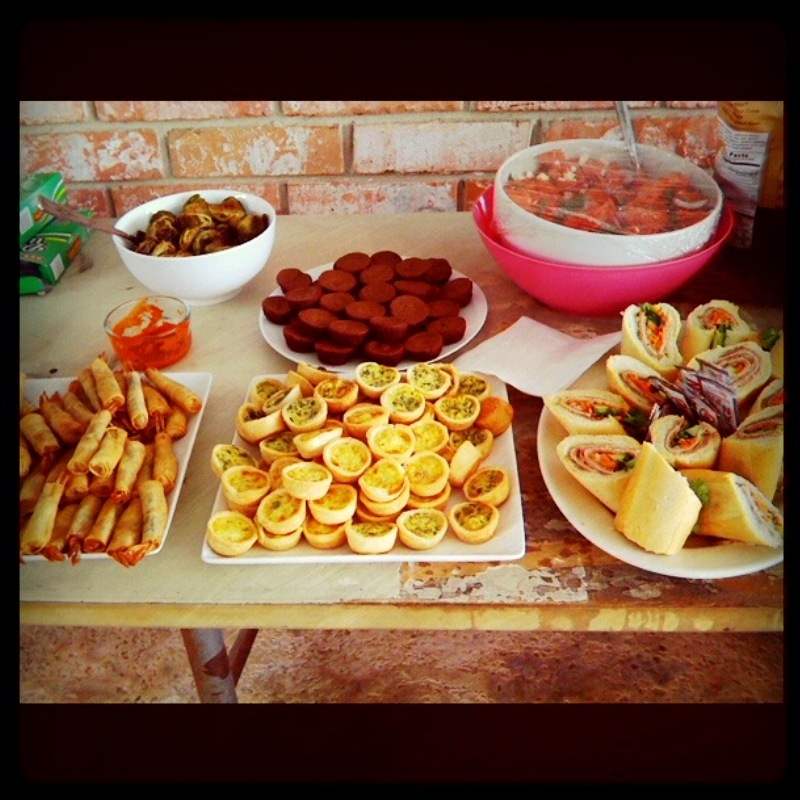 This entry was posted in Food and tagged Pool party, potluck. Bookmark the permalink. Your spread was amazing! Looking forward to trying out your shrimp rolls myself!